Discover the range of natural skin and bodycare from Malée Natural Science, inspired by Africa here at Mankind. Created in 2010 in South Africa, healthy luxury fragrance and body care range Malée Natural Science offer a range of natural and organic products. Inspired by the beauty of landscapes, wildlife, culture and history, the brand will take you on a journey of discover to awaken your senses for a pampering, home spa experience. Formulated using carefully selected natural active ingredients including shea butter, cacao seed butter and avocado oil, it heals, soothes, nourishes and protects. Recognised for quality and effectiveness, they make sure everything in produced sustainably. The Malée Natural Science Verdure Conditioning Body Scrub is inspired by Africa’s wetlands to nourish, uplift and revitalise. With a fresh forest green fragrance and warm, earthy notes of citrus, mint and patchouli, it contains a cocktail of skin loving oils including avocado, sunflower and grapeseed oil with cocoa and shea butter. The sugar and salt texture exfoliates skin, sloughing away dead skin cells for revitalised, nourished and soft sin. 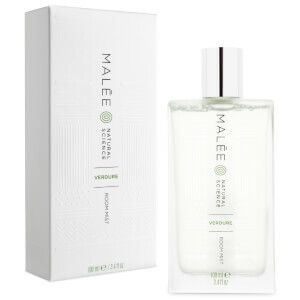 The Malée Natural Science Verdure Room Mist is a room spray which can also be used to refresh curtains, bedding or storage areas. Designed to uplift any space with a burst of invigorating fragrance, it revitalises the mind and improves aromatherapeutic well being. Inspired by African wetlands with a fresh forest green fragrance, it features warm and earthy essential oil notes of citrus, mint and patchouli.